Marstrand - Make av visit to the Island just a short distance north of Gothenburg. Season 2019 with Strömma: Jul 7 - Aug 12 , 2019 - Mondays & Saturdays Boat tour approx 3 hours one way. 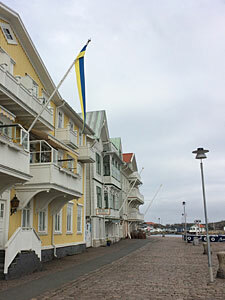 Marstrand is situated about 45 km north of Gothenburg. If traveling by car, park your car and go over via a passenger ferry that only takes a few minutes. Wander around the island at any time during the summer. Of course you can come here throughout the year. Do not miss a visit to Carl's Fortress. Bring some coffee or visit the cafe and sit and look out over the sea. In the middle of summer, you can go buy boat to Marstrand from Gothenburg city. During the summertime idyllic Marstrand are full of tourists, both on the island and around the water there are full of sailors. 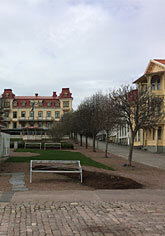 The island belongs to the municipality of Kungälv and located on the two islands Ko Island and Marstrand Iland. 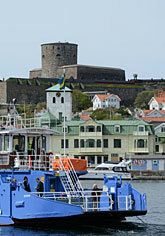 You can get to Marstrand Island via a passenger ferry which only takes a few minutes (car is prohibited on the island.). The island has beautiful white wooden house with cobblestones and cozy shops that open up in the summer. The town of Marstrand history is from 1200s. 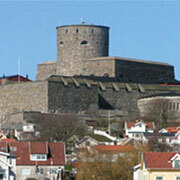 Make a visit to Carlstens Fortress (1658) and feel the history. Do not miss the prisoner Lasse Majas history and about Metta Fock, the only female prisoner at the fortress. 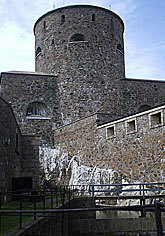 The fortress is open year round, guided tours from June to August. You can stay overnight on the island throughout the year at Carl's Fortress and other hotels on the island. 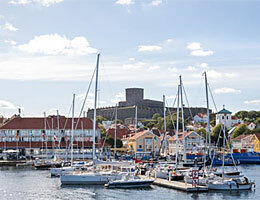 Each year there is Carlstens annual Fortress Games (July, 2019), Marstrand Big Boat Race (May 31 - June 2, 2019) and the Art Walk (April 19-22, 2019). At Easter there is always the Easter bonfire and lots of events for children. 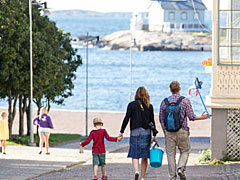 It is said that Easter is the starting point for Marstrand for spring / summertime. In summertime you can go to Marstrand on a 3 hour boat tour. If you book a return ticket the boat goes back at 19.00. The boat arrives to Island Marstrand were you can walk around for about 1 hour. 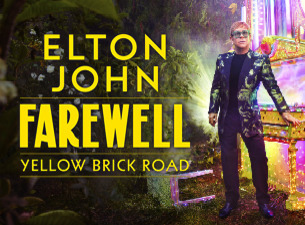 You can also book a return ticket through the link below. The boat trip suits you who do not feel like taking the bus or car to Marstrand. At the same time, you get a lovely guided boat trip to Marstrand island. Enjoy some refreshments, sandwiches and snacks that you buy on board. On the journey from Marstrand to Gothenburg, you can book a west coast buffet. On the island of Marstrand is a path around the island. On Ko island there are three different routes, a black (a little more advanced trail), a blue (easy trail with views over the North Sea) and the last goes on wider roads through settlements. 1658 - Carlstens Fortress construction begins. In the 1100s, Harald Gille King of Norway (1103- 1136) started to build a monastery on the island of Marstrand. The town Marstrand was founded by King Håkon Håkonsson around the 1200's. Around 1449, it was the Danish King Christian I who was elected King of Norway in Marstrand. It was not until 1658 that Marstrand became part of Sweden in connection with the Peace of Roskilde. That same year, Carl began to built the fortress.